Experience the power of F9. Do I have Excel 32-bit or 64-bit? Do I have Excel Click-to-Run? F9 V6 uses Named-User licensing which is also tied to the computer used when activating. Local user profile persistence is required. Environments where local user profiles are deleted on logoff are not supported. (*) Office 2007 has reached end of extended support from Microsoft. Excel 2007 specific issues will not be addressed. Recent Office and Excel comes in two architectures called "bitness" - either 32-bit or 64-bit. Versions of Excel after 1994 and before Excel 2010 were 32-bit only. The F9 add-in must match the bitness of the Excel it is attaching to. There are different F9 installs for 32 and 64-bit Excel. 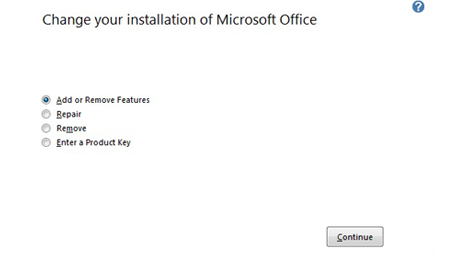 Click-To-Run Office is a technology where Office is not installed on a PC until Click-To-Run is invoked. 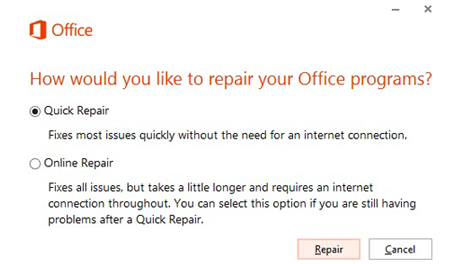 This invocation could be started by clicking the “Install Office” button while signed into the web-based versions of Office 365 or 2016. Alternatively it might be invoked by your IT department as a “deployment”. Traditionally, software is only available to run after it is downloaded and installed but Click-To-Run allows you to start using Excel (or other Office apps) by downloading and giving you access to very basic functionality right away while the remaining part of the Office installation program is downloaded. Once the remaining Office components are downloaded/deployed, (which could take an hour or more depending on your internet/network connection), they are installed in the background while you are actively using Excel, to enable all Excel’s functionality. During this transition time where Office is being downloaded and installed on a PC, this PC does not have a complete installation of Excel. 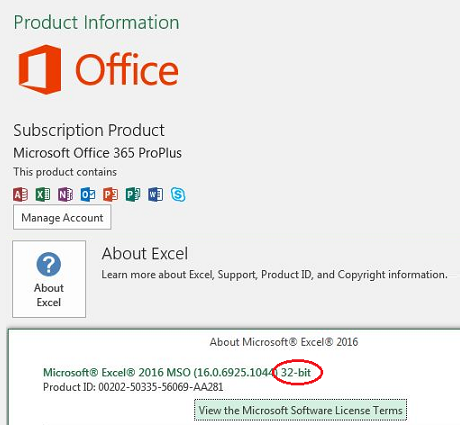 The F9 add-in cannot be installed/added to Excel properly until the download AND install are completed (all Excel add-ins are not compatible until the full install of Excel is available). Actian PSQL™ (formerly Pervasive) up to version 12 (client 32-bit). For F9 Scheduling Hub or F9 add-in Scheduler, the "Allocate Resources at Startup" setting in the Pervasive Control Center should be enabled. Also for F9 products using PSQL on Windows 10 and Windows Server 2016, only PSQL V12 is supported. Individual F9 products typically take up less than 30MB of space. An F9 Professional installation with Datapump and Actian PSQL combined may approach 300MB. This can vary widely depending on the size of the data in your ERP and the functionality you use in F9. The base F9 add-in along with it's dependent components takes approximately 60MB of RAM. For F9 Professional, the base Pervasive database engine requires approximately 140MB of RAM. Large amounts of data may add to this value significantly. It is important to understand that the size of the content of your workbooks can be quite substantial in memory and Excel's memory usage can easily dwarf the amount of memory used for F9 itself. These are per-user amounts as well so shared server resources need to be examined carefully to maximize performance. (*) F9 Scheduling Hub was previously called 'F9 Report Manager' in F9 Version 5. Have a specific question? We’re here to help!